It is a common knowledge of Filipinos that the barangay, the smallest unit of government in the Philippines was named after the balangay (or balanghai), the ancient boat their forefathers used to travel across the seas and got in touch with other Asian civilizations. It's the thrill of actually seeing the sites where the ancient balangay specimens were excavated, rather than being a part of the exhibit of archeology at the National Museum in Manila. True to his being a history buff, right after checking in at Dottie's Place Hotel, hurried for quick lunch of chicken inato at Lutong Bahay ni Aling Cora, finished his work errand for the day and hied off, via a jeepney, to Butuan Regional Museum near the Butuan City Hall where he saw with his own eyes the things that he's been reading all these years. 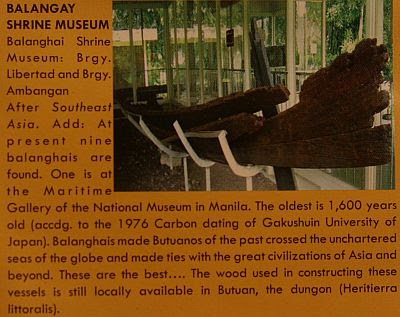 picture of balangay on the Butuan tourism brochure. Picture taking is not allowed inside the museum that Tutubi followed even if others blatantly disregarded the rule-- Tutubi is not pasaway! 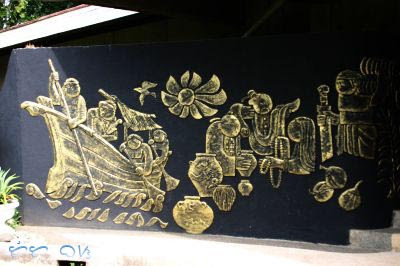 The balangay is a plank-built, edge-pegged wooden boats of yore that used to sail across the seas of the Philippines that enabled Butuanons (how people living in Butuan call themselves) to reach China where official historical accounts tell of Butuan Trade Mission in the year 1001.
bas relief outside the regional museum showing the balanghai paddled by ancient mariners. Inside Butuan Regional Museum are two sections, Archeology that showcases Butuan's archeological finds unique and rare in the Philippines including the Golden Tara of Butuan and Butuan Paleograph. There are also skulls of aristocratic people recognized by the deformities in skull shape introduced during infancy to signify aristocracy as mentioned by the museum curator. Sample items on display are tribal costumes of the Manobo people, a replica of a laksoy (nipa palm wine) distillery and various farming and hunting implements. 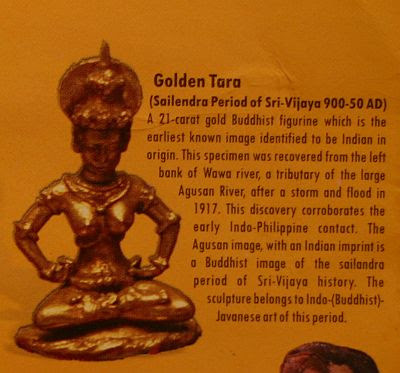 Besides the Golden Tara, other notable exhibits in the museum are the 14-15th century Butuan silver strip (or Butuan Paleograph), and the 10th century Butuan ivory seal, boring ancient writing/scripts still undeciphered up to this day. Two other artifacts that give clues to pre-hispanic Philippines include the 15th century Calatagan jar that's still undeciphered and the Laguna copperplate (now known as LCI for Laguna Copperplate inscription), found in Lumban, Laguna, now displayed at the National Museum in Manila, has been deciphered in 1994 by a Dutch named Antoon Postma. The LCI is a debt pardon executed in 900 AD and is the oldest surviving document in the Philippines using an ancient script (Kavi). 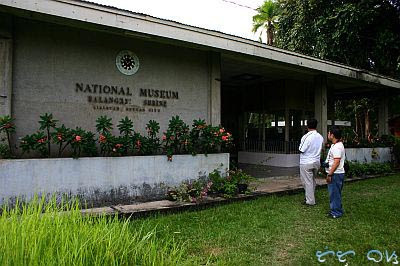 The following day when Tutubi's peers arrived, he again visited the Regional Museum (where the curator recognized him) and shortly after went to the Balangay Shrine in Brgy. Libertad, which is the site of the excavations of ancient balangays the oldest dated in 320 AD according to carbon dating. Some of the balangay are still in their original excavation pit drenched in water years after their found due to the perennial lack of funds. 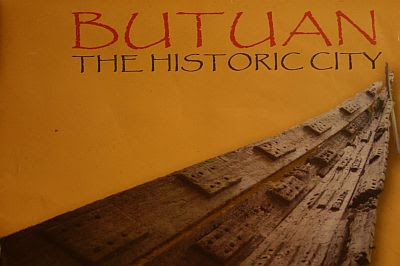 Tutubi will again visit Butuan this year to complete his unfinished business and also slated to visit the alleged true anchorage of Ferdinand Magellan in 1521 plus the place where the first mass in the Philippines was held, reported by chronicler Pigafetta as Mazaua, long claimed to be Limasawa in Leyte, but alleged by Butuanons to be their Masao. If you still think Philippine History began with the arrival of Ferdinand Magellan in 1521, better read again about Butuan and other documents that pushed the frontiers of history to earlier times. It is sad, however, that when civilization was blooming in these islands, the white men came and changed the course of history, a process that bore both good and bad fruits. I really have to revisit that museum. I call that city my home but the last time I was there was when I was still in primary school. shame. wow this is amazing. i've always wanted to know more about the philippines' history before the spaniards came, and i'm not just talking about the ones we've learned in school. What a lovely guided tour! You know I love to read about other countries and cities culture and traditions as much as I like to share about the same from Norway. thanks for posting butuan here...it is nice to know someone credited the importance of butuan history...goodluck on your journey tutubi! those relics look beutiful! my friend from butuan never tells us about the place. acey, how i wish picture takingis allowed inside. i don't know why they still don't allow it. suggest they just ban usinf flash. I came home after 11 years and 10 months of absence and find the place so different than before. May mall na, totally there were lots of improvement. Pati routing ng sasakyan (public transport) nagbago na rin. Kaya I should have been lost without my brother guiding me. I went to the municipality of Magallanes which is named after Ferdinand Magellan. But I haven't been to the museum. I forgot why. I do remember we got the brochure... Ah, probably we were running short of time. Back to Magallanes, merong kahoy doon which is quite old - ewan ko kung ilang centuries na ba yon. I had it photographed. It's a long story but let me briefly sstate that the idea Masao was where an Easter mass was held on March 31, 1521 was an offshoot of the erroneous idea the historical event happened in Butuan. The Butuan error is found in the 1536 story by Giovanni Battista Ramusio who wrote the Easter mass was held at Butuan. Ramusio was translating the French text of Antonio Pigafetta's account of the Magellan voyage. In that true account the site was Mazaua. How Ramusio got the two places mixed up--replacing Mazaua with Butuan--is a mystifying phenomenon. Mazaua was an island surrounded by sea water. Masao is not an island. It probably did not exist in 1521. In fact as late as the 1950 Masao was all mangrove. The idea that Masao was the site was based on Butuan error. This confusion reached its apotheosis when Dr. Sonia Zaide asserted that based on the map found in one extant manuscript of Antonio Pigafetta called the Nancy-Libri-Phillipps-Beinecke-Yale codex Mazaua was Butuan and Butuan was Mindanao. In other words, the world's first Geographical Trinity. Mazaua, according to Gines de Mafra who stayed there for six months in 1543 on his second visit to the island, had an area of from 2213 up to 3930 hectares. Following clues provided by de Mafra a group of earth scientists made an investigation and found an island INSIDE today's Butuan. This should really be proclaimed Mazaua but the reason we cannot do that is because we have yet to find a material artefact that can be traced directly to Magellan. This is not to say it's not there. It's just that we have not really made any extensive excavation in the right area where I think the Mazaua habitat is located. There are several articles at Wikipedia where this issue is discussed. Look for the ff. articles there, "First mass in the Philippines", "Mazaua", "Dimasaua", "Carlo Amoretti", "Gines de Mafra", "Gatighan", etc.